MainAll NewsDefense/SecurityDanon's New Book Calls For "Three-State-Solution"
Danon's New Book Calls For "Three-State-Solution"
"Enough with the two-state-solution. Land-for-peace is over," MK Danon said. Danny Danon has come a long way since his activist days. His new book Israel: The Will to Prevail briefly mentions one of his first headline grabbing moments, when he helped reclaim Jewish property in Jerusalem with a small group of young activist members of a group called Yershalayim Shelanu (Our Jerusalem). For the full interview with MK Danny Danon, download Reality Bytes with Josh Hasten by clicking here. Danon's book covers contemporary issues, such as the Mava Marmara flotilla incident, but also gives extensive historical background information on how the situation got to where it is today. He also writes about US-Israeli relations. 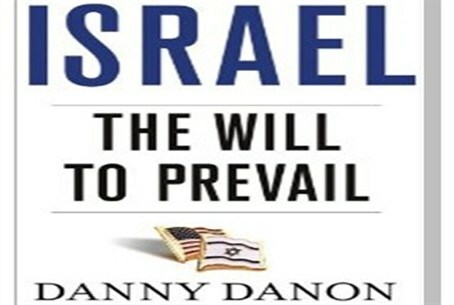 "Israel should do what is good for Israel, period," Danon stated on Israel National Radio. "We must learn from history that we must make our own decisions in the long run." Danon gave the example of Israel's 1981 bombing of the nuclear reactor in Iraq. The incident was initially condemned, but later praised following the 1991 Gulf War. One of the most attention-getting aspects of the book is Danon's "three-state-solution", which he calls "a new paradigm for peace." "Enough with the two-state-solution. Land-for-peace is over," Danon said. "We don't want a Palestinian State. We need to apply Israeli sovereignty over all Jewish communities in Judea and Samaria. It's been about 20 years since the Oslo Accords. That's finished and now we're ready for new ideas." The three states of which Danon speaks are Israel, Egypt and Jordan. "If you go to the Arab-populated cities in Judea and Samaria, you will hear them speaking like they do in Jordan," he said. Danon asserted that the Arab population of Judea and Samaria have Jordanian accents and often travel to and from Jordan. "It's the same with the Arabs of Gaza and their connection to Egypt," he stated. Born in Israel, Danon served as a shaliach (overseas councilor) for the Betar Zionist Youth Movement in the 1990s in Florida. He later achieved other leadership positions, such as being voted Chairman of the World Likud Organization. He was elected to Knesset in 2009. For the full interview with Member of Knesset Danny Danon on Israel-American relations and a three-state-solution, click here. The Reality Bytes podcast is hosted by public relations expert Josh Hasten. It airs live every Wednesday and Thursday from 10:00 am - 12:00 noon Israel time on Arutz Sheva - Israel National Radio. For mp3 archives click here.